MANILA, Philippines - Alden Richards and Maine Mendoza popularly known as 'Yaya Dub' of the hit Kalyeserye of Eat Bulaga broke another Twitter record on Saturday, September 19 as the AlDub loveteam most awaited date happened. 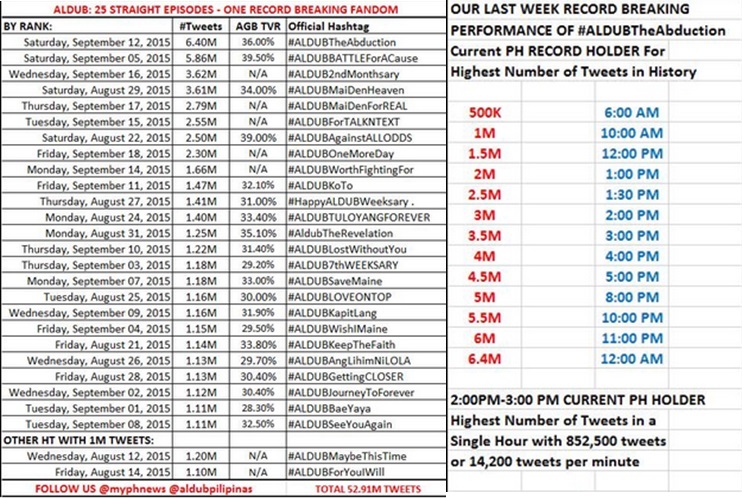 The hashtag #ALDUBMostAwaitedDate already garnered 9.62 million tweets around 3:00pm on Saturday. Avid viewers of the noontime show expect the overnight trend to reach over 10 million mark (Note: Updating for the total tweets). 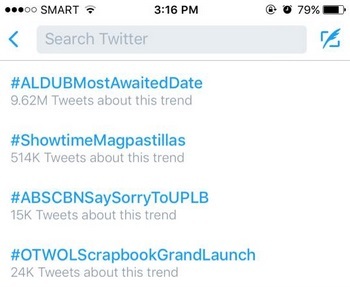 As early as 3 a.m. Saturday, the #ALDUBMostAwaitedDate trended on Twitter with 1.47 million tweets. Alden said he's proud to be part of the #AlDubNation telling the 2-million mark of #ALDUBMostAwaitedDate as of 8:00 in the morning. 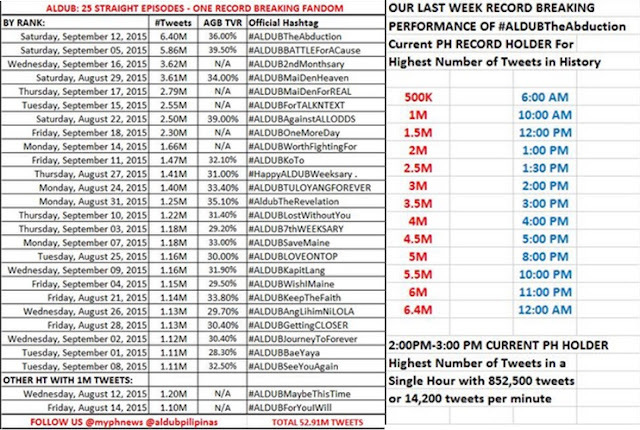 The #ALDUBMostAwaitedDate is set to surpass #ALDUBTheAbduction hashtag on September 12 with 6.35 million tweets in 24 hours to become the top trending topic nationwide and worldwide.